It looks like the exact same coaching staff from the 2008 USA Olympic team will return and look to repeat through the 2012 games. So what does that mean? That Sir Nate McMillan is back! COLORADO SPRINGS, Colo. (July 21, 2009) - They're back! 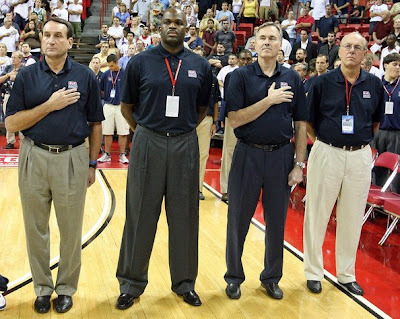 The 2006-08 USA Basketball Men's National Team coaching staff of head coach Mike Krzyzewski (Duke University), and assistants Jim Boeheim (Syracuse University), Mike D'Antoni (New York Knicks) and Nate McMillan (Portland Trail Blazers), a staff that led the American men to gold at the 2008 Beijing Olympics and a three year record of 36-1, will return intact to lead the USA Basketball Men's National Team program in 2010-2012. USA Basketball Chairman Jerry Colangelo officially announced today that Basketball Hall of Fame mentor Krzyzewski will return as head coach of the USA Basketball Men's National Team program for 2010-2012, and that Boeheim, D'Antoni and McMillan were returning as USA assistant coaches. The coaching selections were approved by USA Basketball's Board of Directors and are pending final approval by the USOC Board of Directors. "I'm honored to come back and be a part of our nation's basketball team for a second time," said McMillan. "Mr. Colangelo and Coach K have put together a great coaching staff, and I know those guys are just as hungry as I am to grow the U.S. program and work towards winning the World Championship and another gold medal. Working with USA Basketball has been a terrific experience for me." Over the course of 2010-2012, USA Men's National Teams will compete in the 2010 FIBA World Championship (Aug. 28-Sept. 12 in Turkey); if necessary the 2011 FIBA Americas Olympic Qualifying Tournament (dates and site TBD); and if the USA qualifies, the 2012 Summer Olympic Games (July 26-Aug. 12 in London, England). "When you have a good thing going you don't mess with it. We accomplished a great deal last quadrennium and we want to keep the ball rolling in the right direction," said Colangelo, who served as the Managing Director of the 2005-2008 USA Basketball Men's National Team program. "Mike and the staff did an incredible job last quad and he is more than entitled to have another run at it. I've said it over and over, he was the right guy at the right time and that is still true." "It was a huge honor to be selected as the USA National Team coach the first time. It is still a huge honor. The experience of being the head coach of the USA National Team for three summers was the best experience I've ever had in coaching" said Krzyzewski. "The upcoming three years will be a new experience and hopefully, it will be as rewarding. I am really looking forward to representing our country at the 2010 FIBA World Championship in Turkey and at hopefully the 2012 Olympics in London. Also, the chance to work with Jerry Colangelo a second time is such a unique opportunity and one that I am looking forward to taking full advantage of. "It is amazing that Jim, Mike and Nate would do this again. For the past three years, we've handled the staff as if we're all co-coaches. That is how we'll handle it again. We've all taken ownership, we've loved being together and most of all, we've loved representing our country. What a great statement for continuity that our coaching staff will remain in place until 2012." USA Basketball announced on June 25 that 25 top rising NBA players had accepted invitations from to participate in the 2009 USA Basketball Men's National Team mini-camp that will be conducted July 22-25 in Las Vegas, Nev. USA Basketball also previously announced that the coaching staff for the mini-camp would be Toronto Raptors head coach Jay Triano, Utah Jazz assistant coach Tyrone Corbin, Detroit Pistons assistant Dave Cowens, former New Orleans Hornets assistant Kenny Gattison, and Minnesota Timberwolves assistant Jerry Sichting. The July USA Basketball Men's National Team mini-camp will feature practice sessions on July 23 and July 24 at Valley High School, and the mini-camp will be capped by the USA Basketball Showcase, a Blue-White intra-squad game, on Saturday, July 25, 8 p.m. (PDT) at the Thomas & Mack Center on the campus of UNLV. Tickets are now on sale for the 2009 USA Basketball Showcase, with seats priced at $10 to $75. Tickets can be purchased through www.UNLVtickets.com or 702-739-FANS. USA Basketball initiated its historic men's national team program in 2005 and capped the 2005-2008 quad competitions with a magnificent gold medal run at the 2008 Beijing Olympics. USA Basketball's National Team program during the three-year period between 2006 and 2008 compiled a striking 36-1 overall win-loss record and just as importantly reestablished the USA team and its members as positive ambassadors for the United States and the sport. The USA squad culminated the quadrennium by finishing 8-0 to reclaim the gold medal at the 2008 Beijing Olympics, the USA's first gold in a major international competition since 2000. The USA National Team also won gold at the 2007 FIBA Americas Championship with a 10-0 record to qualify the U.S. men for the 2008 Olympic Games. In the program's first year, the U.S. captured the bronze medal with an 8-1 record at the 2006 FIBA World Championship in Japan. Since first fielding a USA Basketball team of legendary NBA stars in 1992, USA Basketball senior national teams comprised of NBA players have claimed gold medals in 10 of 13 major international basketball competitions, while compiling an impressive 100-7 overall record (.935 winning percentage) in those international competitions and a record of 33-1 (.971 winning percentage) in exhibition games.